Born: 1896, St. Clements, Ipswich. 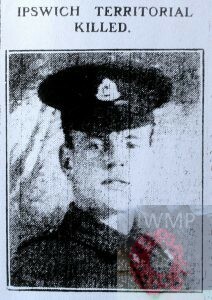 Died: In the morning of the 5th February 1915; age 19; Died at No 2 British Field Ambulance of shot wounds received near Neurve Chappelle whilst leading his men up to his post in the trenches. He was serving along side his brother Private Stanley Borrett. Residence: ‘Stanley Villas’, 12, Newton Road, Ipswich. Employed: as an Apprentice in the Lawn Mower works of Messrs. Ransomes, Sims & Jefferies, Ipswich. 1901 50, Alston Road, Ipswich. Christopher was 5 years old and living with his parents & siblings. Charles Edgar Borrett, 45, an Iron Fitter & Turner, born Ipswich. Esther Borrett (nee Samuel), 43, born Ipswich. Charles William Borrett, 20, an Iron Turner & Fitter, born Ipswich. Joseph Henry Borrett, 16, an Iron Turner, born Ipswich. Albert Victor Borrett, 13, an Office Assistant at Foundry, born Ipswich. Stanley Borrett, 11, born Ipswich. Clarence Edward Borrett, 8, born Ipswich. Ellen Elsie Borrett, 2, born Ipswich. 1911 12, Newton Road, Ipswich. 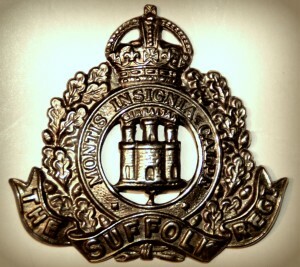 Christopher was 15 years old, a Fitter – Motor – General Engineers. He was living with his parents, siblings & a paternal aunt. Charles, 55, a Turner & Fitter – General Engineers. Stanley, 21, a Carpenter – General Engineers. Clarence, 18, a Carpenter – General Engineers. Gladys Evelyn Borrett, 9, born Ipswich. Emma Potter, 44, a widow, born Ipswich. Soldiers’ Effects to Charles Edgar Borrett & Esther Borrett – parents. Christopher is also remembered on the Orwell Works Memorial Ransomes Sims & Jefferies Ipswich. Gladys Borrett (later Gladys Flory) was Christopher Borretts youngest sister, my Grandmother, she lived at 12 Newton Road all her life, she spoke many times of losing her brother saying he was shot by a sniper , her other brothers survived the war. Christopher Borrett was my great uncle. My grandad was his brother.